"You can never conquer the mountain. You can only conquer yourself." I hope this Quick Study on Banff Mountains will help you get to know the main peaks around the Banff townsite and make you feel at home here in the mountains. Mountains are like people - they have different moods and different looks. The same picture taken on a different day - never seems to look the same. Take tons of pictures - it is the digital age and who knows what you might capture! Mt Cascade (2998 m) is probably the most recognizeable of Banff's mountains and is the the first mountain to greet you as you enter the park. It is a huge mountain that actually extends over 10 km! Mt Cascade is easily visible from Canmore and makes such a pretty picture! As soon as the winter melt begins, you can even see from the highway how water "cascades" down the southeastern slope. Some choose to do guided iceclimbs on Mt Cascade in the winter months. This is the mountain that has been made famous in shots taken from Cascade Gardens looking down Banff Avenue in the town of Banff. You know the one! This is one you won't want to miss. 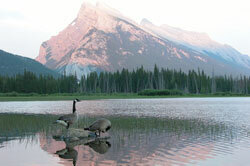 Mt Rundle (2950 m) is the mountain that guides you from Canmore to Banff. This mountain has often been photographed reflecting onto Vermillion Lakes and it has therefore become symbolic of the Canadian Rockies. If you would like to experience this mountain up close, why not rent a canoe at the canoe docks and canoe the Vermillion Lakes. Go to the lakes in the early morning or at dusk for some great light and breathtaking colours. You may even spot some wildlife who make the lakes their home. This mountain was named after Reverend Robert Rundle who was a missionary to the native people living here in the Rockies. Tunnel Mountain (1690 m) has got to be the most confusing mountain for visitors because this mountain HAS NO TUNNEL!! The CPR had originally thought that this mountain would be the ideal place for a tunnel, but then an alternate route through the valley was chosen. This mountain is right in town and easily accessible for a good uphill walk and a super view of Banff and the entire valley. I like to call it "Sleeping Buffalo" because as you drive towards Banff, it really does resemble a buffalo fast asleep. Tunnel Mountain Campground is situated here on the mountain if you are looking for a nice place to camp. On Tunnel is the Hoodoo Trail which offers panoramic views of the valley and the surrounding peaks as well as Banff's famous "Hoodoos". Sulphur Mountain (2451 m) is appropriately named after the sulphur-laden water that seeps out from its core creating the hot springs Banff has become famous for. Sulphur Mountain is also home to Banff Gondola where you can go for snack or a meal and enjoy stunning panoramic views of all the surrounding mountain peaks as well as the Sundance, Bow and Spray valleys. On Sulphur Mountain you also have boardwalk access to Sanson Peak which was named after meteorologist and Banff Park Museum curator Norman Bethune Sanson. If you are up for it, you can also hike up and down Sulphur Mountain along the switchbacks - make sure you go when the mountain trail is free of ice and go prepared! If you hike up and want to take the gondola down - you will unfortunately have to pay! Booooooo! If you are interested in how Banff Mountains and other rocky peaks got their names or what the names mean, you can pick up a handy little book called "Central Rockies Placenames" by Mike Potter. This little book is handy in size and offers you over 1000 interesting entries and beautiful colour photographs of some of the more important mountains you won't want to miss!